Matteo Di Giovanni holds a Ph.D. in Philosophy from the Scuola Normale Superiore, Pisa, Italy, and a Ph.D. in Graeco-Arabic and Islamic Studies from Yale University. He has previously served as Assistant Professor of Late-Ancient and Arabic Philosophy at the Ludwig-Maximilians-Universität of Munich, Germany. 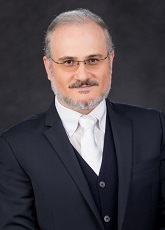 He has been visiting scholar at University College London, the Thomas Institut of Cologne University, and the Institut Français d’Etudes Arabes of Damascus, Syria. Medieval Arabic Philosophy and Classical Arabic Textual Studies. Di Giovanni, M. (2011) Motifs of Andalusian Philosophy in the Pre-Almohad Age. Documenti e studi sulla tradizione filosofica medievale.209-234.